The weather is freezing here in Belgium. Although it feels like Winter it's still technically Autumn which is confusing. I wish I was more in sync with the seasons. Or the seasons more in sync with me. You might have noticed my layout changed, don't worry, it's temporary. I'm working on an awesome new design with my older sister but I wanted to get rid of the archive and other crap on my sidebar. It will be perfect and cozy when I get it done but I think we all know getting things done isn't my greatest talent. As I'm writing this it's already dark outside, and it's so weird. I like it though, I think it makes everything feel more like Autumn. You also might have noticed that I now use Autumn instead of Fall. I was being bipolar and mixing different kinds of English with each other. From now on I'll be using British English, for the simple reason it reminds me of London and that's the coziest city on earth. I'm such a complex, sophisticated person *takes a small sip of some fancy drink, puts on hat to look mysterious*. All joking apart, today I present to you my Autumn favourites. Let's get started. 1. Yellow Raincoat: I love this coat! I've been wearing it for three years now and it's still in perfect condition. It's from Petit Bateau and the striped fabric inside is so soft and warm. It keeps me dry when I ride my bike though thrashing rain. Belgian weather is rainy 24/7 I'm not even kidding. The pockets are big enough for all my junk: a tube of vanilla lip balm, my phone, a little plastic fish and a handful of plastic gems. 2. Muji notebook; I've been writing a lot lately and this book is the perfect size. I love writing in here and I've been doing it almost every day since the first day of Autumn. It's almost full now and it's one of my first journals I filled all the way to the end! 3. Muji orange and cinnamon candle: I've never been a scented candle person but when I smelt this candle I fell in love with it's scent immediately. Orange and cinnamon is the perfect winter scent. These candles are so so good as well. When I just open the lid the scent was very overwhelming. Just imagine a Christmas elf throwing handfuls orange peels and cinnamon in your face and you might know how good this candle smells. 4. TEEN WITCH shirt: I made this TEEN WITCH shirt last week and omg! It turned out so cool and when I wear it I just feel like a witchy rebel girl. 5.Velvet Rodarte x and Other Stories shorts: These are so soft as well as versatile and they go with all kinds of cool tights. If you know me in real life you can probably confirm that I've been wearing these non-stop during these colder months. 6. COS black loafers: they're perfect loafers and they really compliment my mood lately. I recently saw Sing Street and everyone wore black loafers and white socks and my heart was singing while I was sitting in that empty cinema. 7. 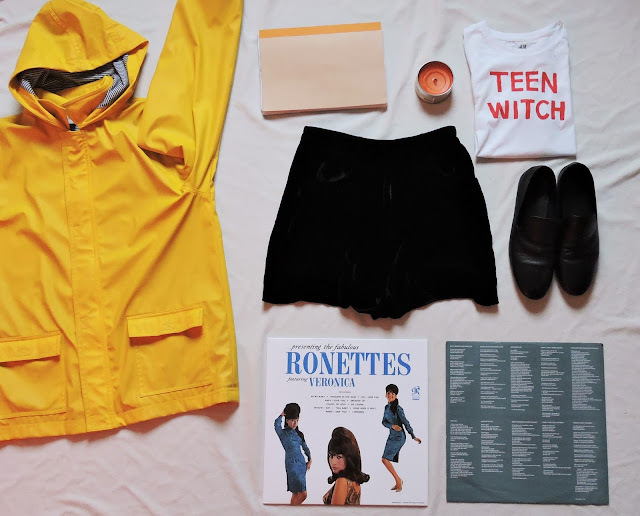 Records: I got the Ronettes record a few weeks ago. Fifties girl groups are my main thrill in life. The Smiths record is one of the first records I listened to and I didn't like it back then but now it is one of my favourite records of all time. The Smiths, along with The Cure and Duran Duran are in my head non stop (thanks to Sing Street again). 'So this is my life, and I want you to know that I am both happy and sad and I'm still trying to figure out how that could be', from The Perks of Being a Wallflower. 'you're not happy being sad is, that's what love is. Happy sad.' 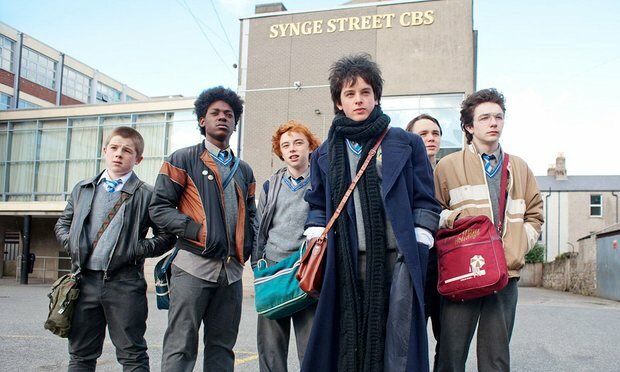 from Sing street." The Catcher in the Rye is just perfect. Holden is so dramatic. I love the book. I love Holden. You can probably guess what my favourite film is. 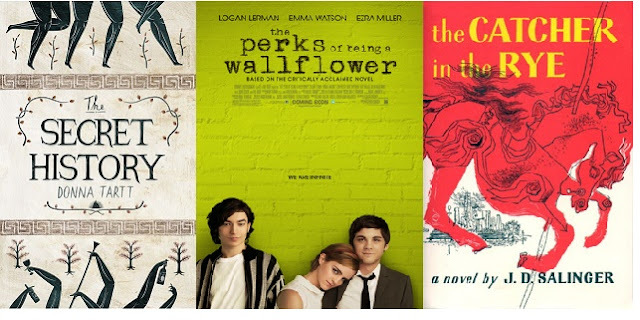 Sing Street of course! It's definitely in my top 3 of favourite films of all time. The music and the characters are so awesome and the clothes and just aah. My crappy writing doesn't do this film justice I swear. It's one of those films you don't want anybody to see because nobody will ever like it as much as you do and it's something so personal. You just don't want people to say something bad about it which is very selfish of me. Zo leuk dat je die t-shirt zelf hebt gemaakt en een warme regenjas is idd echt onmisbaar voor Belgische herfsten (vreemd woord).